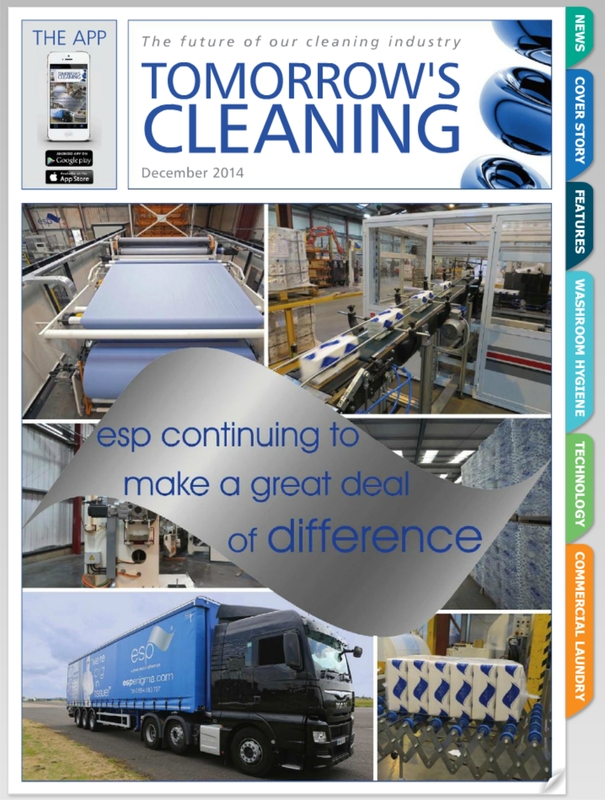 ESP are featured in the December issue of Tomorrow’s Cleaning Magazine – Out Now! 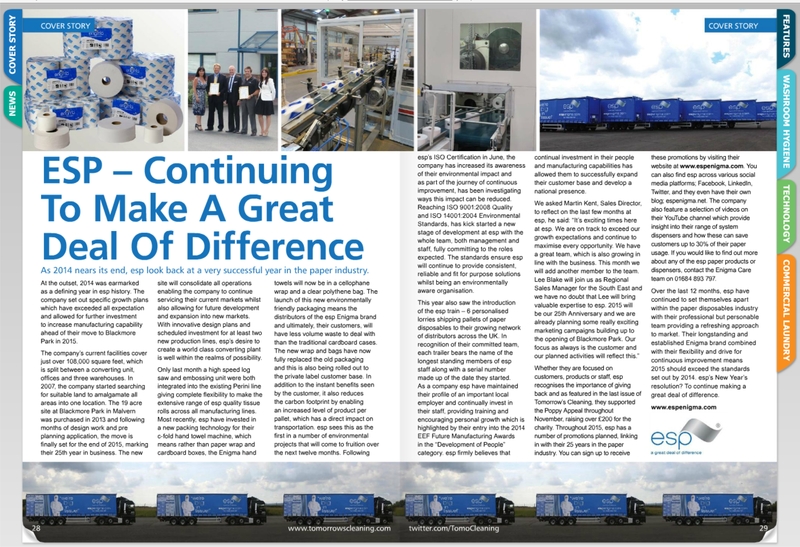 As 2014 nears its end, esp are taking a look back at a very successful year in the paper industry. At the outset, 2014 was earmarked as a defining year in esp history. The company set out specific growth plans which have exceeded all expectation and allowed for further investment to increase manufacturing capability ahead of their move to Blackmore Park in 2015. The company’s current facilities cover just over 108,000 square feet, which is split between a converting unit, offices and three warehouses. In 2007, the company started searching for suitable land / premises to amalgamate all areas into one location. The 19 acre site at Blackmore Park in Malvern was purchased in 2013 and following months of design work and pre planning application, the move is finally set for the end of 2015, marking their 25th year in business. The new site will consolidate all operations enabling the company to continue servicing their current markets whilst also allowing for future development and expansion into new markets. With innovative design plans and scheduled investment for at least two new production lines, esp’s desire to create a world class converting plant is well within the realms of possibility. Only last month a high speed log saw and embossing unit were integrated into the existing Perini line giving complete flexibility to make the extensive range of esp quality tissue rolls across all manufacturing lines. Most recently, esp have invested in a new packing technology for their c-fold hand towel machine, which means rather than paper wrap and cardboard boxes, the Enigma hand towels will now be in a cellophane wrap and a clear polythene bag. The launch of this new environmentally friendly packaging means the distributors of the esp Engima brand and ultimately, their customers, will have less volume waste to deal with than the traditional cardboard cases. The new wrap and bags have now fully replaced the old packaging and this is also being rolled out to the private label customer base. In addition to the instant benefits seen by the customer, it also reduces the carbon footprint by enabling an increased level of product per pallet, which has a direct impact on transportation. esp sees this as the first in a number of environmental projects that will come to fruition over the next twelve months. Following esp’s ISO Certification in June, the company have increased its awareness of their environmental impact and as part of the journey of continuous improvement have been investigating ways this impact can be reduced. Reaching ISO 9001:2008 Quality and ISO 14001:2004 Environmental Standards, has kick started a new stage of development at esp with the whole team, both management and staff, fully committing to the roles expected. The standards ensure esp will continue to provide consistent, reliable and fit for purpose solutions whilst being an environmentally aware organisation. 2014 also saw the introduction of the esp train – 6 personalised lorries shipping pallets of paper disposables to their growing network of distributors across the UK. In recognition of their committed team, each trailer bears the name of the longest standing members of esp staff along with a serial number made up of the date they started. As a company esp have maintained their profile of an important local employer and continually invest in their staff, providing training and encouraging personal growth which is highlighted by their entry into the2014 EEF Future Manufacturing Awards in the “Development of People” category. esp firmly believe that continual investment in their people and manufacturing capabilities has allowed them to successfully expand their customer base and develop a national presence. Whether they are focused on customers, products or staff, esp recognise the importance of giving back and as featured in the last issue of Tomorrow’s Cleaning, they supported the Poppy Appeal throughout November, raising over £200.00 for the charity. Throughout 2015, esp have a number of promotions planned, linking in with their 25 years in the paper industry. You can sign up to receive these promotions by visiting their website www.espenigma.com. You can also find esp across various social media platforms; Facebook, LinkedIn, Twitter, and they even have their own blog; espenigma.net. The company also feature a selection of videos on their YouTube channel which provide insight into their range of system dispensers and how these can save customers up to 30% of their paper usage. If you would like to find out more about any of the esp paper products or dispensers, contact the Enigma Care team on 01684 893 797. Over the last 12 months, esp have continued to set themselves apart within the paper disposables industry with their professional but personable team providing a refreshing approach to market. Their longstanding and established Engima brand, combined with their flexibility and drive for continuous improvement means 2015 should exceed the standards set out by 2014. esp’s New Year’s resolution? To continue making a great deal of difference. This entry was posted in Uncategorized and tagged Blackmore Park, difference, dispensers, ESP, Malvern. Bookmark the permalink.